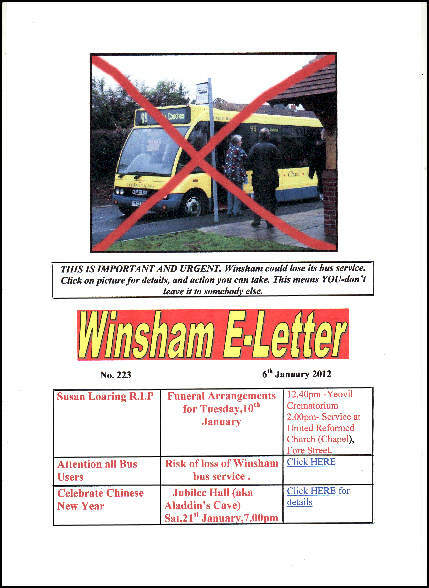 The first Winsham E-letter appeared in October 2006 and since then it has been sent to subscribers, free of charge, usually once a week. Initially some twenty five households were on the mailing list. This has now grown (2016) to over two hundred, and increases most months as new people move into the village . Currently it reaches over three quarters of the households who are on line (approx 75/80% of all Winsham households ). It also enables past residents of the Parish, and those with family links to keep in touch with what is happening. The main purpose of the E-letter is to promote activities in the parish by sending a very brief and transitory communication, which can be read and then discarded, the reader noting the items that are of interest . It lists in three columns, the name and location of the event, date and very brief additional information that might be considered necessary. When more detailed information about an event is available , this information is placed on the Notice board of the Parish Web Site or the new Parish Council web site and a hyperlink is added to the E-letter, so that a mouse-click on the link in the E-letter provides instant access to this detail. This useful facility ensures that the e-letter always remains brief. A popular feature of the E-letter is the 'village' photograph-different each time, with a short caption. These are usually of an event that has happened since the previous edition. This 'show-casing' of an event often links to more pictures from that event very quickly after they have taken place, sometimes within hours, on the Parish Web Site. The Winsham E-Letter compliments the Joint Parish Magazine, and does not compete with it. A recognised problem with the Joint Parish Magazine in publicising certain types of events or news, is the relatively long copy date of up to three weeks, that is necessary for it's production. In contrast, the E-letter can be produced and sent out in less than one hour. This underlines another use for the E- letter. Sometimes information needs to be distributed quickly-information about a lost pet, for example. On another occasion there was a pollution scare relating to the mains water supply. Occasionally it is used to inform the parish of an untimely death. In these cases a 'special edition ' is distributed, usually in the form of a simple e-mail, with no other topic covered. An important secondary purpose of the e- letter is to encourage subscribers to visit the Winsham Parish Web site and the Winsham Web Museum. In this it has been very successful. Analysis of visits to the Parish Web site immediately after the distribution of an E-letter shows a dramatic increase. The e-letter also carries links to emergency services, and also announces when Minutes of meetings from some village organisations are available on the Parish or Parish Council Web Site, i.e. latest Parish Council and Jubilee Hall Management Committee meetings. been referred to in web page relating to 'Winsham on the Web'. One benefit of this is that news can get out to the community even more quickly than the weekly e-letter can achieve. A further recent trend is the use of the accompanying e-mail message to be used to provide additional information on a subject not dealt with on a web page, or that is not suitable for the three column format of the e-letter itself. It is often of a topical nature. In October 2017, the 500th edition of the e-letter was published. Below copies of the E-Letters sent can be accessed. They give an accurate record of the day-to day activities of the village over the period since the Autumn of 2006.The links contained in the archived E-letters below do not usually work, as the original target web page closes. Further coverage of the major events such as Street Fairs can be seen in the 'Winsham at Play' Gallery of this Web Museum. Minutes of Meetings can be found in the Parish Council Gallery and the Jubilee Hall Gallery.